I was approached recently by a company who helps women with fertility issues. They wanted to share some information about mature women and options that are open to them in regard to conception later in life. I had my babies when I was in my 20's - and had no issues with falling pregnant and hadn't thought about it since then. But, then I thought about those who may not have been so fortunate, and so I'm sharing a post that I'm hoping we all find interesting and helpful. Disclosure: This is a collaborative post by Egg Donation Friends. I feel it is a guest post that is relevant to, and of interest to Midlife women and I was in no way influenced by the company. Midlife crisis, syndrome of an empty nest or menopause are usually associated with women in their late forties or early fifties. When we picture a woman around the age of 48 or 50, we think of a mother of teenage or adult children. Perhaps we think of a woman realizing her passions, travelling, etc. What about pregnancy and motherhood? We usually associate it with younger women. But what if you were not able to expand your family earlier or want to have children with your new partner, it may not be too late. Thanks to the development of Assisted Reproduction Technology it is nowadays possible to have a healthy baby after menopause. 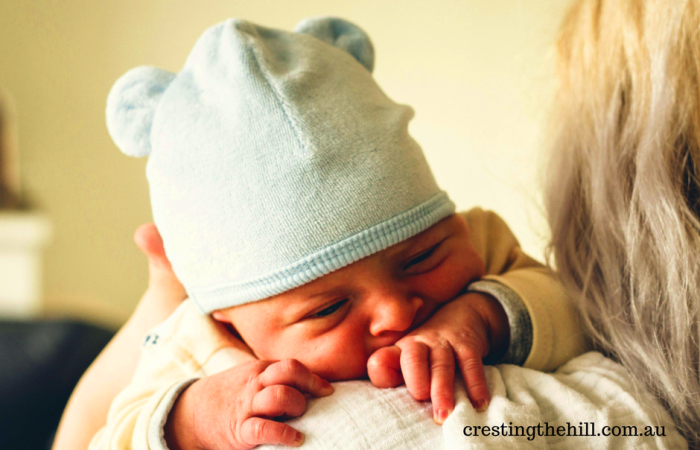 Are the late forties or early fifties the right time to become a mum? It is highly individual issue and if a woman feels this is her dream, why not realise it? Modern science and medicine can help you with that. How? The answer is IVF treatment. Using IVF with own eggs may be ineffective for women 45+, that is why fertility doctors recommend using donor eggs to achieve a healthy embryo and then baby. Egg donation treatment is also great solution for younger women who suffer from premature menopause or diminished ovarian reserve. The numbers do not lie; for example in the USA since 2013 there has been a slow but steady rise in IVF and egg donation treatments for women over the age of 50. Fertility clinics report that donor egg programs in late forties is a practice that is gaining ground fast. Using fresh or frozen donor eggs is definitely an option to consider if you wish to experience pregnancy and have a healthy baby. You may not have your own eggs or they may be of very low quality an using them could result in implantation failure, miscarriage or serious genetic complications. Using donated eggs from young and healthy donors can give you greater peace of mind. Egg donors who are available at reliable egg banks and IVF clinics are thoroughly screened and tested for genetic diseases. If you are new to donor eggs idea, you can get advice on egg donation from EggDonationFriends who offer free patient support and information about treatments and clinics. If you are in your forties or fifties using frozen donor eggs for your IVF raises your chances for a successful conception and pregnancy. IVF success rates with donor eggs over 40 and 45 are usually reported as 45-55% of chance of having a live birth while the success rates of getting pregnant naturally at this age would be below 4%. This type of treatment seems a very sensible option, both from a medical and practical standpoint. Most IVF clinics let you choose your own egg donor based on what is important for you. Let’s not forget about donors – they are incredibly generous women who give an amazing gift, gift of life. Having a baby always brings huge changes to your life no matter if you are 28 or 48. There are certainly many benefits of becoming a mother later in life. Many women feel they are more experienced, fulfilled professionally and financially secure. This stability means they can focus on their new baby without sacrificing their career or education. Our society is changing and we more frequently see mothers (and fathers) of different ages. To be honest, there are also challenges connected with late motherhood, but isn’t our life is full of challenges on an every day basis? Thought provoking post. I was 31 when I had my daughter - and although we ddn't have IVF, it was problematic. There are absolutely advantages and challenges associated with motherhood at any age - these are probably amplified in mid-life. Would I be wanting to start again in my late forties? No - but that's just me. One of my family members had her first at 42 - without IVF - and is bringing her baby up alone. On the plus side, she has the maturity and the financial stability that many of us don't have in our 20s. On the down-side, we've all finished and our children are grown. It's such an individual thing & one everyone seems to have an opinion on when the only opinions that really matter are those of the parent/s. I think your last sentence sums it up beautifully Jo - everyone has a different story and a different journey - what we take for granted might actually be the dearest wish of somebody else. It's great to know that there are choices available. I almost think we could be better mothers at this age. We have so much more experience and knowledge, that it could help how we parent. I had my children at 33, 35, 38. Now as I near 55 - my youngest is 16 and gaining her independence quickly. I could not imagine having to shuttle, hustle, clean, cook, etc. for younger children at this point in my life. That said, I've known many a grandmother who had full care for their grandchildren. I believe it is every individual's choice -- and one of my mantras is "There are lots of ways to do life" - more power to you! I completely agree Janet - I had my children in my mid 20's and that was the ideal time for me - but it might not be for someone else. We all have different journeys and it's nice to know that you might not have missed the boat if you desperately want a child later in life. Three under 3 makes my toes curl Min - I think you've earned the peace you have now! But you're right, for others who missed their ideal age to get pregnant, it's good to know that there might still be hope for a longed for baby. I tried to get pregnant in my early 40s and initially just went for artificial insemination (donor sperm) as my doctor said I was only 'socially' infertile (as I was single and had never tried to get pregnant) so I didn't qualify for rebates for IVF. I tried again a couple of years later (this time going for IVF) but some tests revealed my chances were then (43 or 44yrs old) far too low. I think most women in their 40's are battling uphill to have a viable chance at pregnancy with their own eggs Deb - there is a lot of secrecy out there - and a lot of older celebrities who don't mention they had egg donation to fall pregnant. Maybe it's a good thing to open the conversation up for a more realistic take on the whole idea of conception after 40? I think you're right Kathy - the age you have your children is a personal choice and for some women, they wait that little bit too long and miss out. Perhaps this is an option that might be worth considering - something to investigate for sure. Thanks for reading and commenting - and I completely agree that motherhood at any age is a challenge - but that doesn't necessarily preclude older women from being great mums! I sometimes feel I would have enjoyed motherhood more if I was 30+ when I had my children. Like you, Leanne, I was in my early 20s so I still wonder how the children survived :) When I remarried I thought it would be lovely to have another child, however, my husband wasn't keen and so we didn't go down that path. It is easy for me to say that I wouldn't have wanted children after I turned 45 - I'm enjoying grandmotherhood instead. However, for those who desperately want a child then it is good for them to have some options. I think it's definitely all about options Sue - and things are so different today than they were 30 years ago when we were having our babies. Women have so many choices and opportunities, second marriages are common, and to have the opportunity to realize the dream of having a baby isn't something to dismiss lightly - no matter how old you are. An interesting topic and very relevant to women who find themselves later in life longing for a child. I had my children when I was 30 and 33. I'm not sure if I would have had enough energy in my 50's for a baby and toddlers, but then again I would have had much more knowledge of life and been more settled. I think it just depends on life situation and personal preferences, but how wonderful that we have the choice and need not be inhibited by our biological clocks. Technology has brought with it so many more open windows Jo - I'm relieved that my child bearing years are behind me and that I found it so easy to conceive, but for those who left it late or who've been trying for a long time, it's lovely for them to have another option available to them. While I'm definitely looking forward to being a nana in the hopefully-not-too-distant future, I absolutely cannot imagine being a mum again at this age - I think it might well be the death of me!!! I'm thankful I had my babies in my 20s, although we did have a period after the first when we wondered if we'd be able to have another. Being a Nan is the BEST Sue - you'll be a natural at it I'm sure :) I think second marriages often lead to a discussion on whether to have more children - some really want it and others not so much - it's good that we have the options available now to be able to have those conversations - regardless of our ultimate choice. This was very interesting, indeed! Not my choice, but I know of one couple who waited until they were 40 to conceive (naturally) just because they wanted to be financially stable and have the maturity they felt necessary for raising a child. I know two other women who had babies in their 40s. Personally, I never wanted children to begin with, so I have no horse in this race. My child bearing days are done and dusted Red - so I'm not in this race either, but there are many women out there who leave having children until their 40's and I think that it's really good to know what's available if natural conception isn't working for them - post 40 is pretty tricky that way! I had our first two at age 32 and 34. We were among the older set of parents at all school functions. Then I got pregnant again at 42. We were really old parents then, but she is such an independent, focused, mature young adult. She has just finished college. I wonder if it was a combination of our being old or her being observant and learning from watching how her siblings were going through life. Perhaps if we had had another one when I was 43 or even 44 it would have been okay but I certainly wouldn't have wanted to start again at 50 or later. I know that even though I am a very patient person, I don't know if I want to "give up" any me time now. I'm actually quite surprised at how many commenters here had their children in their 30's Janet - I thought our generation were having them in their 20's but I was wrong. It seems that people are leaving it later and later to start families - so there must be a lot of women in their 40's who are trying - and this is a great option for them to consider. I had my children at 33 and 38. We were older than most of the other kids parents, especially my younger one, and my kids were aware of it. That's a consideration also for an older parent. How is the child going to feel when strangers mistake their parents for grandparents? That said, by the time I became a mother I had already traveled, knew what it was like to support myself, and was ready to devote myself to another human being. Now though, we're ready for the nest to be empty, but my youngest is still finishing up college, and I can't imagine what it would be like to still have to wait another ten years before getting my life back. As I mentioned to Janet above, I'm surprised at how many women of our age left having children until their 30's - and this generation seem to be leaving it even later - I think there is a real need for women in their 40's struggling with conceiving to have options available to them to give their dream a chance. But you're right - it would be really hard work raising a child at our age! I am not typical and have never had the urge to have a baby. I had my children when I was very young it is a joke in the family that the maternal instinct passed me up. Two of husbands daughters are older and the number one compliant I hear is the energy needed just isn't there, one is 45 with a 7 yo and the other is 40 with a 2 yo. It is well that there is something that can help if a baby is desired at a later age but I think there are a lot issues that need to be taken into consideration before someone commits. I've never had that clamouring to have babies either Victoria - we just decided it was the right time and off we went. For those who leave it later, it seems to become a much bigger decision and there is a lot more involved in the conception and raising of those babies - it's nice to not be in that boat, but there are many out there who are and this is a something to add to the mix for thinking about. I think it's wonderful that there are options out there for older women to have babies, I just worry about the kids when they are older having to deal with an aging parent before they are emotionally or financially ready to or even the death of a parent. I guess every stage of parenthood comes with it's own set of problems Amy. When we parent young we have all the financial stress of getting on our feet and later we have the work/life/parenting balance to get right. When we're older there's our mortality to deal with - I guess 50 and 60 and even 70 isn't all that old these days and hopefully kids who have older parents won't be dealing with their deaths too early in their childhood. gosh it kinda gob smacks me a bit to think about it - on the one hand it is great that options are opening up and obviously some women feel this is right for them and on the other doesnt menopause tell us something about our bodies - fertility has declined and we are entering into another phase of our lives..
it is not the 'having of the baby' it is the many years that follow . as a grandparent I love the time spent with the baby the 2 year olds the near 8 yr old - love it and have reasonable health and energy but it can be exhausting and good to know that they have parents to take over ... I had a child at 21 and then 2 more in my 30's. that was a good age - some maturity and still heaps of energy to run and play with them .. I take my hat off to women who are taking this on at menopause - very interesting leanne thank you. It's so different for all of us isn't it Sandra? 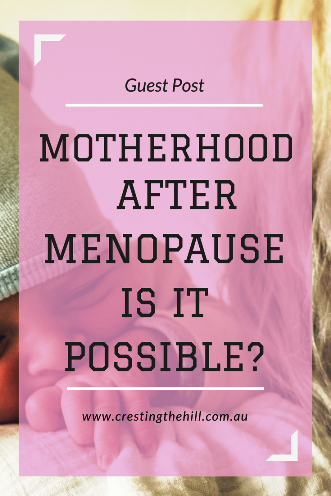 I can't imagine having a baby in my 50s either, but if it was the burning desire in my heart and I had a sense of unfinished motherhood, it's great to know that there are options available to us still - and it's a way to know whether our time is definitely up or not!